Crap, I should’ve posted this yesterday, on Mental Health Awareness Day. But today is International Day of the Girl Child, which fits just as well. 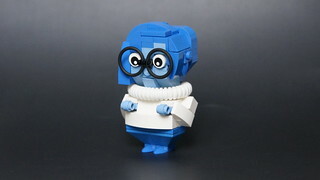 This is, of course, Sadness from the Pixar Movie Inside Out. It’s an amazing film. If you haven’t seen it, do it. I made Sadness as part of a series I never finished, let’s call it „My Favorite Fictional Female Superheroes of 2015“. First was Furiosa, Sadness was second and I never finished building Jessica Jones (I failed at her face and abandoned the project). Fun fact about this model: The neck is hinged, to allow proper moping, but the giant turtleneck pushes the chin back up. Fun fact about my life: back in university I was tutored in animation by a fellow student who's now with Pixar and was the character modeling and articulation artist for this movie’s main character, Joy.